The Singapore Lyric Opera (SLO) Children’s Choir returns to perform at the Esplanade Concert Hall. 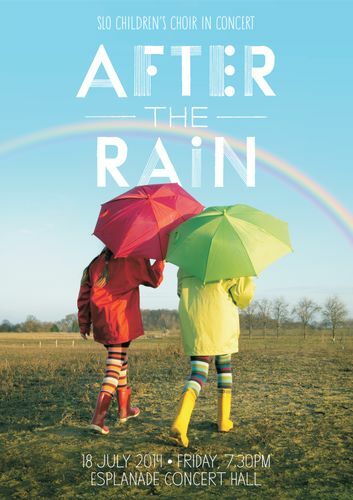 Aptly titled as After the Rain, the concert celebrates the most essential of elements, which can be seen in the beauties of our rivers and lakes, seas and oceans. Waterways form the backbone of any civilization; they are not only the primary source of life, but are also integral to a thriving commerce, an effective infrastructure, and other societal needs. As a small city state that relies on our waterways for our growth, we know this only too well. Established choral conductor, Rose Loh, and celebrated pianist, Shane Thio, will lead the concert which features a selection of pieces such as Stephen Paulus’ Silver the River, Zechariah Goh’s Ikan Kekek and Benjamin Britten’s The Ship of Rio, that all centre on the theme of waterways. This is the third instalment of a concert that is to be presented by SLO Children’s Choir and friends - Bedok South Secondary School, Geylang Methodist Secondary School and Yishun Secondary School, all of whom are guest choirs of the SLO’s Singing for All programme. This outreach programme is specially created to encourage the young to sing. Miss Ng Siew Eng, General Manager of SLO says, “ The Children’s Choir has been an intrinsic part of the SLO since it first started in 2006. The choir has performed in both concerts and operas. In their twice yearly concerts – in July and December – the themes of concerts bring awareness to our surroundings and our neighbours.